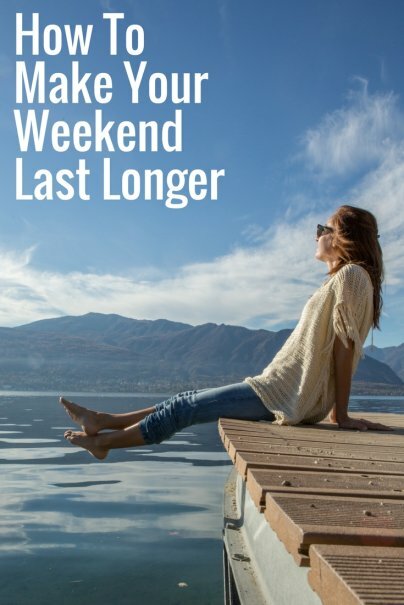 What's not to love about weekends? The stresses of work fade away and life seems almost limitless. In fact, the only bad thing about weekends is their duration. Forty-eight hours isn't nearly enough time to decompress, recharge, and prepare for the coming workweek. So, how do we make those two precious days feel longer? Turns out, the trick is to try new things. As David Eagleman writes in his book, The Brain: The Story of You, pursuing novel activities provides our brains with fresh data and "stretches" our perception of time. In contrast, doing the same old things (like binge-watching Game of Thrones) doesn't supply our noggins with new input and makes our weekends seem fast and forgettable. So on Saturday morning, resolve to break out of your routine and embrace the unfamiliar. Here are eight ideas to get your started. No matter where the weekend takes you, get there in a new way. Choose a slower pace by biking or walking to your destination. Make the journey part of the experience. Stop for coffee along the way, wander through a used bookstore, or explore a local farmers market. For longer trips, engage with fellow travelers and avoid parking hassles by taking public transportation. Escape rooms are themed adventure games that require participants to solve a series of puzzles or riddles in order to "escape" from a room within a set period of time. To be successful, everyone has to work together, follow clues, and strategize. Enlist a group of friends and build a fun evening around this adrenaline-filled experience at your nearest escape room venue. Besides phenomenal bargains, yard sales and estate sales offer buyers a chance to hear the story behind each item they select. It's an interactive experience that just can't be matched in any other way. If you've never whiled away a Saturday wandering block-wide yard sales or strolling through a house where literally everything you see is for sale, give it a try. You'll be hooked. Shake up your routine with a spontaneous weekend getaway. Pack the essentials, grab a friend or two, and see what other parts of your state have to offer. Many bus and train lines offer daylong excursions to nearby areas of interest. Bring a book and let someone else drive for a change. Not only does volunteering make a difference in the lives of others, it helps us learn new skills and deepens our connection to the community. Consider donating your time and talent to a local animal shelter, youth organization, or food pantry. Just a few hours every weekend can change your whole perspective.